Non-mortgage – the loans are explicitly stated as credit that cannot be used for the purchase of a home. Year-long due date – the loan is typically due back within a 12-month period. Interest rates of 100% – the loan’s interest rate is generally 100% or more. The standard borrower in the FCA’s analysis due to pay back exceeding one-and-a-half times the sum of the original loan. Loan value of £250 – the loan value was, on average, around the £250 mark, with borrowers having to pay back a typical amount of 1.65 times the amount borrowed (£413 on average). What were the FCA’s findings? The FCA published multiple posts on such social media platforms as Twitter, showing their findings from the analysis into high-cost short-term credit loans. 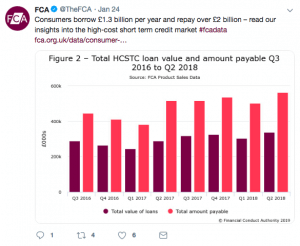 As shown in Figure 1 (one of multiple posts on the FCA’s Twitter regarding the results of their HCSTC research), the number of loans for the specified year of July 2017 to June 2018 providing as visual proof to the FCA’s claimed findings “Consumers borrow £1.3 billion per year and prepay over £2billion”. 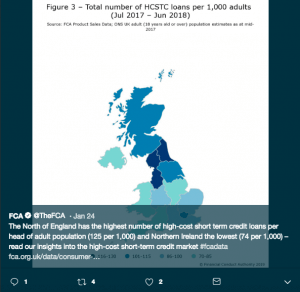 As shown in Figure 2 (a post from the FCA’s Twitter page of their HCSTC results) the FCA’s results also found that those in the North West of England were significantly susceptible to borrow high-cost short-term loans, whilst people in Northern Ireland, speculated to be partly due to the more common use of credit unions, were very unlikely to borrow such loans. As can be seen on figure 2, the FCA claim that “The North of England has the highest number of high-cost short term credit loans per head of adult population (125 per 1,000) and the Northern Ireland the lowest (74 per 1,000)”. Additionally, other categories of which made up a significant portion of the high-cost short-term credit borrowers include the younger generation, with over a third (37%) between the ages of 25 and 34. In addition to this, tenants (including council) making up 37% of the borrower’s percentile in addition to those living with their parents, who made up 26%. Although, as stated by the previously mentioned Vicky Shaw, there has been a “crackdown on payday lenders”, with number of times borrowers can extend their due date for a loan in addition to the cost of such borrowing, having been capped, the results from the FCA’s research unfortunately display that even with this measure in place, 67% (two thirds) of such high-cost short-term loan borrowers were over-indebted. What does this mean for the future of HCSTC loans? Overall, what these recording show is not only an increase in high-cost short-term credit loans from 2016, but also highlights the importance to the interest rates of such guarantor loans. The raised awareness to the expense of such loans further implores potential borrowers to consider their loan applications extensively, and could therefore lead to less over-indebted loans due to such ample consideration these results and weighing up of the costs and benefits for such loans.